The weekend after I got back from sailing was the August bank holiday weekend. 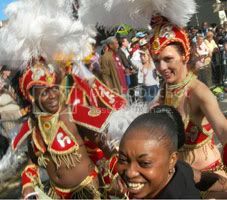 Every year, we're usually away but as I was home this year, I managed to get down to the Notting Hill Carnival. It's one of the largest street parties in the world with about half-a-million people attending that Monday. Honestly, I've never seen so many people in one place before. Check out the official website. It was relatively easy to get to. My buddy David and I took the train down to Paddington and then the Hammersmith & City tube line right to where the action was. To get home, we simply walked back to Paddingtion. Once in Nottinghill, we just walked around a lot shuffling along with the crowd. It's fabulous for people watching and a gold mine for photography. I found shooting with a small compact camera was rather difficult in this situation. The sun was too bright for the LCD monitor and the eyepiece too small for someone who wears glasses. Generally, you just shoot tons of pictures and hope a few come out. Here's a superb gallery of carnival photo's. Despite the huge crowds, we managed to see some of the parade which is good fun. Not particularly slick or anything but good fun. I have no complaints about watching scantily clad girls dancing along the street. There's tons of ethnic street food and plenty of beer too. We even ran into a break dancing show in the park. The only difficult thing with the Carnival is the lack of toilets. Residents take advantage of it to offer their own for £1 a go. If I was around each August bank holiday, I'd go every year.